According to the American Geriatrics Society 40% of nursing home residents are affected by depression, yet depression often goes undiagnosed or un-treated in elders living in long term care facilities. Depression is the No. 1 under-treated illness in the geriatric population. Unlike the profile of other diseases that cluster with aging, depression does not show up on lab tests, or EKGs. It is often masked by other chronic illnesses and can mimic dementia. 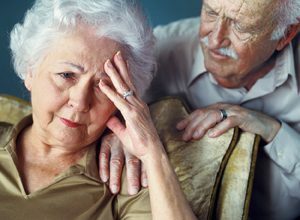 These and many other reasons make depression in the elderly a difficult challenge. Sadly, it is easier to ignore the problem than to consult with a geriatric psychiatrist however it is worth it. Find someone who will take the time to choose the right medication and then titrate up to a therapeutic level with benefit/risk considerations in mind. If you want to get a real world look at the magnitude of this public health problem just go to your nearest nursing home or assisted-living facility and look around. People slumped in wheel chairs line the halls in even the best homes. If they are still able to walk you will see pale and withered men and women trying to be brave while walking gingerly, afraid of falling. Some wander around looking for “home.” Many more give up walking about the same time they give up caring. Some bear their inner storms in silence while some cry and some literally scream for help. Those are the ones the staff learns to tune out. What’s not to be depressed about? It is a grueling business getting old. Arthritis, congestive heart failure, diabetes, chronic obstructive pulmonary disease, kidney failure and pressure sores from bad circulation aren’t even the worst of it. The unrelenting deterioration of the physical body is insult enough to make anyone despondent but the real traumas are those inflicted on the spirit by bruising emotional losses peculiar to old age: loss of one’s health, spouse, family members, friends, home, independence and self-esteem. The cumulative stress of a lifetime compounded by the rapid devastations of old age can crystalize into acute emotional distress. Elders find coping mechanisms failing them. Depleted hormone levels and neurotransmitters so vital to mental and emotional balance can render the burdens of life completely overwhelming in the twilight years. If our culture tends towards “pharmacological stoicism” when it comes to physical pain, it is semi-sclerotic when dealing with emotional pain. We can do better. Improved quality of life can be achieved for the anxious, depressed elderly through a judicious, compassionate use of medications. While all psychoactive medications need to be prescribed and monitored carefully, let’s not throw the baby out with the bathwater and underutilize these medications either. When we have the means to ease the suffering of our elders, even just a little, it is truly shameful to refuse to do so.